blog.HalloweenAdventure.com | Latest News from the Costumes Trend FrontLines! : Thanksgiving Costumes: Pilgrims! This Thanksgiving, do a little reenacting of the original Thanksgiving scene. Split the family in half, and have one side wear Indian costumes and one side wear Pilgrim costumes. It’s the perfect time to discuss the coming together of people of different traditions, and it’ll be fun! Our last post featured a variety of Indian costumes for adults, so now we’ll show you our selection of Pilgrim costumes. Remember, there are always more costumes online! 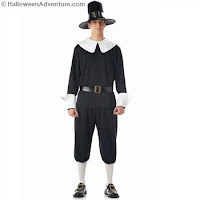 Our Pilgrim Man Adult Costume is the perfect beginning to a pilgrim family! It features a typical pilgrim outfit, including black pants, a black top with white scalloped collar and cuffs, and a belt with gold detailing. All you need is a black top hat, and you’re good to go! The Pilgrim Man costume looks even better when it’s paired with our Pilgrim Woman Costume. Much like its male counterpart, this one looks absolutely believable! It features a black dress with white apron and white detailing in the top, a pilgrim collar and cuffs and a perfect matching bonnet. Look as though you’ve just stepped off the Mayflower with our Pilgrim Boy Costume. With matching black pants and black shirt with traditional white collar, as well as matching socks, this outfit is a guaranteed hit. It looks even better when part of a family costume. 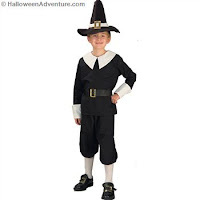 For an even more traditional look, try our Pilgrim Boy Thanksgiving Costume. Includes a black cotton hat with white strip and gold square accent, black cotton shirt with white lapels and white folded sleeve cuffs, black cotton pants with elastic that cinches just below the knee and a black belt with gold clasp. Gold shoe buckles and white nylons sold separately. Shoes not included. Last, but certainly not least is our Pilgrim Girl Costume. This one looks perfect as the final piece of the family costume, and features a long grey dress with an oversized white collar and matching apron. It even comes with a matching white bonnet. One minute in this costume and you’ll swear you’ve gone back in time! For more Pilgrim costumes, check out our online store. Keep checking the blog for more Thanksgiving costumes, and Christmas costumes as well. Remember, you can also always stock up on Halloween costumes in advance! Hey, there’s nothing wrong with a little planning.